Mondays from 24th September to 15th October will have coaching for intermediate/advanced level players looking to improve their game. 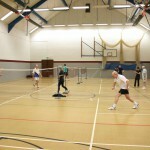 We’ve entered our usual mens, ladies and mixed teams into various local leagues and no doubt we’ll run a few more of our highly popular social evenings. We’re also happy that we’ve managed to fend off a rise in membership fees for another season. After a couple of months of waiting, we’ve just heard that the club has been selected to become one of the ‘blue token’ recipients at Tesco in Tetbury during March and April 2018 which is great news. Please support us by voting for us when you can! 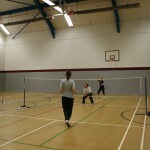 Whilst it isn’t something that Tetbury Badminton Club have organised, we’re delighted to say that a 6 week badminton beginners/improvers course is going to run at Tetbury Leisure Centre on Saturday mornings from 10-11am starting on March 3rd. Please contact SWR Leisure Centre for more details. Beginners and intermediate coaching on a Monday night! Posted on 25th October 2017, by Ollie Strutt . Comments Off on Beginners and intermediate coaching on a Monday night! 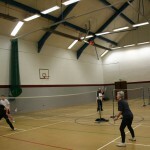 Tetbury Badminton Club is looking for new male and female players of any age and experience. We are running new coaching sessions with a qualified coach on Monday evenings. Rackets provided if required. The season kicks off on the 4th of September this year and it looks set to be a great one. Following the success of the training by Roger Stroud last season, we’re hoping to get him to come down to the club again this season to run a few more sessions. We’ve also entered our usual mens, ladies and mixed teams into various local leagues and no doubt we’ll run a few more of our highly popular social evenings. We’re also happy that we’ve managed to fend off a rise in membership fees for another season. 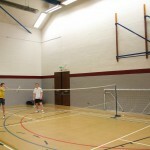 Whether you’re new to badminton or an experienced player we encourage you to come on down to the club. We have players of all abilities so you’ll be more than welcome, and we’re offering the first night free to new members. Keen to attract new members, we’ll be running a number of promotions from September to kick-start the new season. 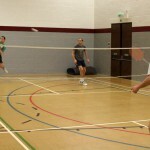 The season will open with a free taster evening on Monday September 12th, 8-10pm, where non-members are welcome to come and try their hand at badminton. 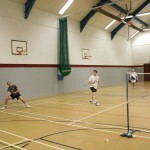 Players of any level can attend and racquets and shuttles will be provided by the club. The following week, on Monday September 19th, the club will host a free coaching taster session with well-respected coach, Roger Stroud. 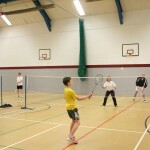 Coaching will take place from 8-9pm for beginners and 9-10pm for improvers. After the first session, players will have the opportunity to sign up for a five-week coaching course at £3 per session for adults and juniors. Again, racquets and shuttles will be provided. Posted on 12th March 2015, by Conrad . Comments Off on Extended Season!!! Quick note to announce a new end of season. 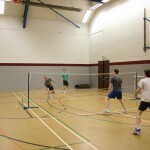 Three courts will be available on Monday and one on Thursday from 4th April-30th April. After what was a fairly comfortable win against St Lukes at Wellsway School in sunny Keynsham, the Men’s first team are top of the table halfway thorough the season. 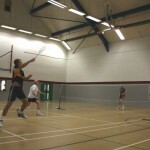 On the 2nd of October the men’s second team played their first match of the season in division 3 of the Swindon league. The opposition were Brecon and the game was at home. Following a few close matches, with Yannick and Will determined to halve every one (they succeeded), the overall score was 9-8. With one game left to play, the pressure was on the final pair to consolidate the victory. The first end had been close so anything could happen. At 16-all Tetbury crumbled with 4 points practically given away to hand the opponents game point.